Sonic the Hedgehog 2 is a platform game that was released a year after the original and only in Europe and Brazil. It features six main levels and an unlockable one if you manage to collect all the Chaos Emeralds and beat the last stage. The original game didn't feature any loops but here they're present and Sonic has had a significant speed boost. Compared to the Game Gear version this is much easier to play due to the extra screen space and decreased difficulty. First up is Underground Zone with its minecart rides; the opening boss is one of the most difficult in the portable game but here it doesn't have the high bouncing ball attack making it a breeze to defeat. Sky High Zone is annoying with unintuitive glider controls and many hidden pits. Aqua Lake Zone is as boring as all the other water levels as everything slows to a crawl and Sonic feels very unresponsive. Green Hills Zone only seems to feature a few hills, clusters of coins and not much else! Gimmick Mt. 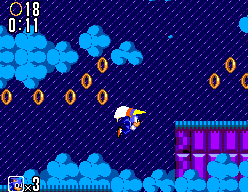 Zone is dull but it does reference Scrap Brain Zone from the original 16-bit game (1991, Mega Drive) with its rotating wheels you can spin off to reach higher platforms. Scrambled Egg Zone is the last level and it's frustrating due to the trial and error required to navigate the pipe mazes; at least it's more manageable than the Game Gear version as you can actually see what lies ahead. The final Silver Sonic boss is a total joke and can easily be beaten with little strategy or effort. Speaking of bosses, Aspect chose some weird protagonists here including giant robot birds, pigs and a performing seal! What's worse is that you don't directly face Dr. Robotnik unless you unlock the secret Crystal Egg Zone. The Master System version of Sonic the Hedgehog 2 is much better than the handheld port but it still doesn't mean that it's a good game. The bland level design and strange bosses make this a rather soulless experience that doesn't capture the spirit of the series. Random trivia: Although you can only play as Sonic in this 8-bit version the ROM code contains full sprite sheets for Tails suggesting that he was originally supposed to be a playable character.